Adult apterae of Chaitophorus horii ssp. beuthani are whitish to pale yellow. The body is rather long and narrow, with the body length 2.1-2.5 times the maximum width. Antennal segment III has only 0-4 hairs, the longest of which are only 5-20 μm long. Abdominal tergites 1-5 each have 12-30 smaller accessory hairs between the long spinal, pleural and marginal pairs. The cauda has a distinctly knobbed apex. Alatae (not shown here) have black dorsal abdominal cross-bands. Chaitophorus horii ssp. beuthani lives on the underside of the leaves of narrow-leaved willow such as Salix viminalis and Salix fragilis. It usually feeds from the leaf midrib. 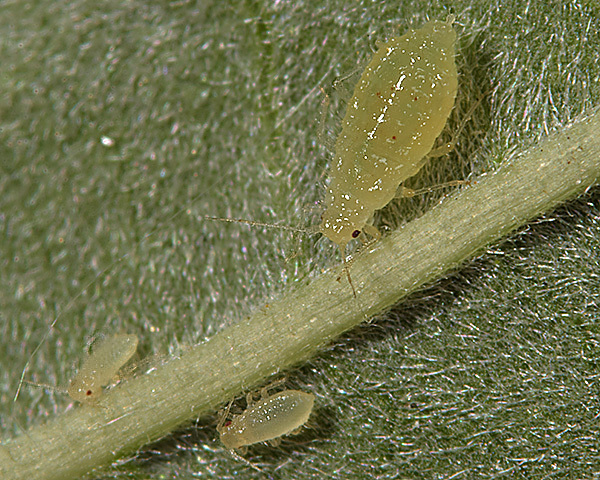 Unlike many Chaitophorus species, the pale willow leaf aphid is never, or almost never, attended by ants (Shingleton et al., 2005). 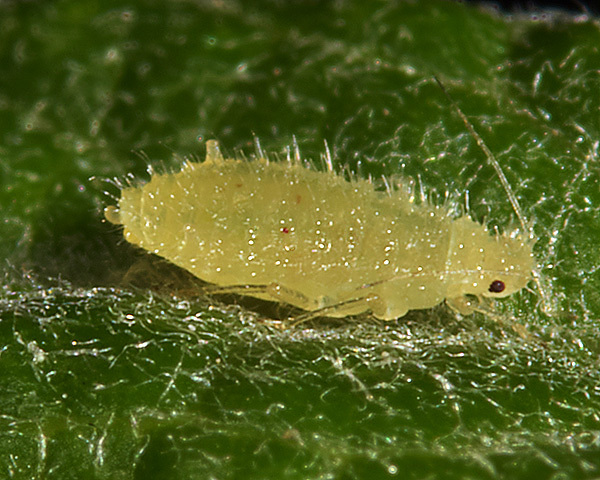 In this respect it is very similar to the pale sallow leaf aphid (Chaitophorus capreae). Chaitophorus horii ssp. beuthani also resembles that species in having short mouthparts, as do other leaf feeders like Chaitophorus truncatus, Chaitophorus tremulae, and Chaitophorus salijaponicus niger,. 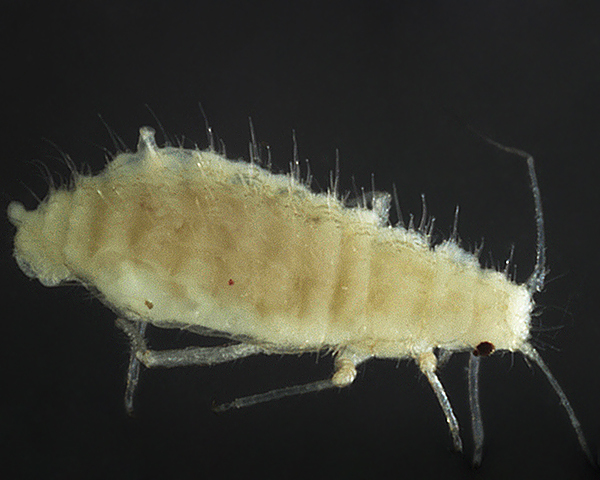 Differences in mouthpart length influence susceptibility to predation as aphids with longer mouthparts take longer to withdraw their mouthparts if disturbed. 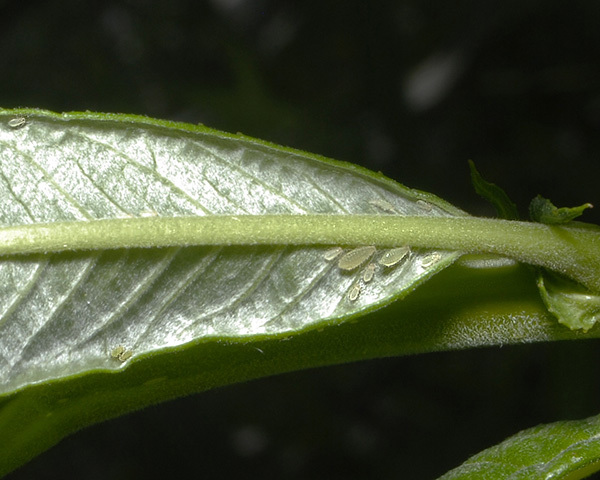 When ant-tended, aphids increase the honeydew concentration of melezitose, a trisacharide particularly attractive to ants (Fischer and Shingleton, 2001). 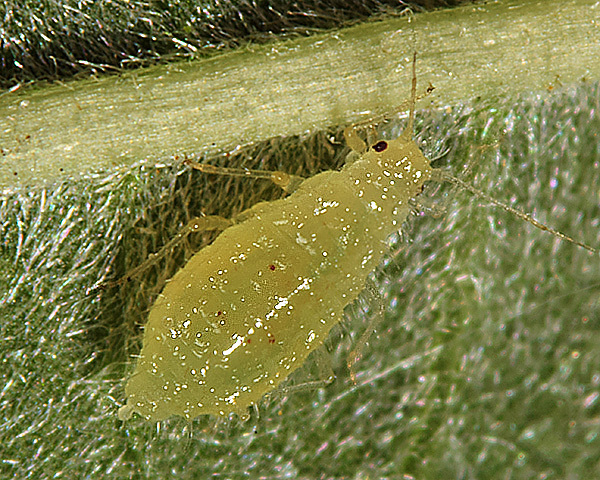 There is evidence that such adjustments incur costs to the aphids (Stadler and Dixon, 1998, Yao et al., 2000), which are likely to increase if there is competition between aphid species for ant partners. Shingleton et al. (2005) suggested that only in species feeding on deeper phloem elements will the costs of these traits be outweighed by the benefits of protection from predators. Of the 30 aphid species Blackman & Eastop list as feeding on basket willow or common osier (Salix viminalis) Baker (2015) lists 23 as occurring in Britain: Aphis farinosa, Cavariella aegopodii, Cavariella archangelicae, Cavariella intermedia, Cavariella pastinacae, Cavariella theobaldi, Chaitophorus capreae, Chaitophorus horii, Chaitophorus horii ssp. 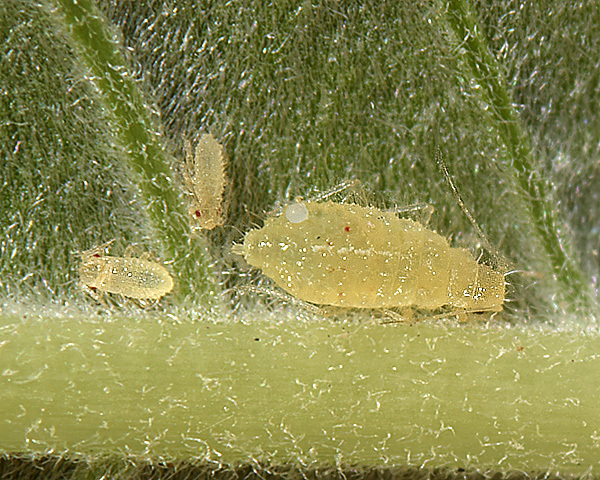 beuthani, Chaitophorus salicti, Chaitophorus salijaponicus niger, Chaitophorus truncatus, Chaitophorus vitellinae, Phylloxerina capreae, Plocamaphis amerinae, Plocamaphis flocculosa ssp. brachysiphon, Pterocomma jacksoni, Pterocomma konoi, Pterocomma pilosum, Pterocomma rufipes, Pterocomma salicis, Stomaphis longirostris and Tuberolachnus salignus. Of the 26 aphid species Blackman & Eastop list as feeding on crack willow (Salix fragilis) Baker (2015) lists 20 as occurring in Britain: Aphis farinosa, Cavariella aegopodii, Cavariella archangelicae, Cavariella konoi, Cavariella pastinacae, Cavariella theobaldi, Chaitophorus horii ssp. beuthani, Chaitophorus salicti, Chaitophorus salijaponicus niger, Chaitophorus truncatus, Chaitophorus vitellinae, Pemphigus saliciradicis, Phylloxerina salicis, Plocamaphis amerinae, Pterocomma jacksoni, Pterocomma konoi, Pterocomma pilosum, Pterocomma rufipes, Pterocomma salicis and Tuberolachnus salignus.